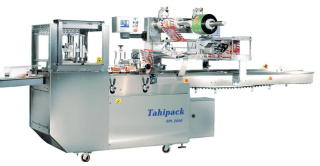 Flow pack is a used for packing mainly food. Conventional machines uses fixed gear ratios and couplers. Changing the size of the product was a time consuming procedure. And some time it was not even possible. Owners needed to machines for different product sizes. Servo installation reduce mechanical components and made the machine run smoother and quieter. Coupler and other maintenance costs drops. Product size changing is done only by the interface and there is no need for mechanical adjustments. Along with the CAM function of the “hot knife” the is an implementation of a register mark function for printed film.